The End sequence is really nice. Three new screens. Since they are in the middle of level 4, I made the game start at the first new screen. When level 4 is done, then I will begin work on level 5 (the pigs' "fartress"), and once that is over, the game will be for the most part complete. Works really good.The new levels,especially the 1st one are heavy,but not impossible. thanks for your time and effort you put into this game! Whoa! This game is turning out to be pretty damn good fun! I love the Uncle F__ker theme in the begining! Now only if you could get a fart to ring out each jump and a little puff of pixelated green fog or something lol!!! EXCELLENT JOB mate! I would not be surprised if you can sell this one right on the South Park website when its done! Really though, I can see Matt & Trey wanting a piece of this one just for the giggle value alone. I can also see one of the boy's fathers playing this game on a retro video game themed show when he hauls out the 2600 after playing a wii for the first time to show the boys where it all comes from and ruining the wii cause it hasn't got a T & P game. Eventually the boys break the 2600 and the father leaves to search for another one on a worldly quest down back alleys etc to get to flea markets etc. I dunno, but I see something happening if this is presented to the right people. Great stuff! Edited by Noelio, Wed Sep 3, 2008 11:33 PM. Thanks for the good comments. You're Canadian, so could you check something for me? If you have the right difficulty set to A at the beginning, you get the ending, which has the Canadian national anthem. How good did I do converting it to the 2600? New version with three added screens. You start on the last level of level 4, so you can see the screen that says "Level Five." Level 5 is the last level, so it's pretty hard, but I'll make it around 15 screens. Bug fixing time. If you lose your last health bar on an ending screen, once you get to the first screen, there were floating signs instead of pigs. I fixed this. I also put in a red pig animation. 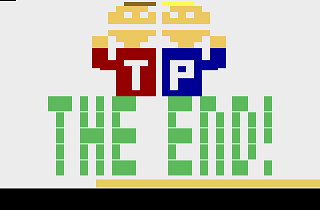 If you want to see it, download the tandp46neo.bin, which is a special binary file (where the bugs weren't fixed quite yet), on the first screen of level 5, you'll see it. Added 2 more screens. Now all I need is about 10 more screens, then the inevitable bug fixing process, and the game will be done! It's fine indeed. I think that's the first time I ever heard the Canadian national anthem on a 2600! Hehehe! 3 new screens added. you start at the first one. I'm going to design 5 more and then designing screens (the hardest part of making the game) will be done. that is possible, like that nice Adventure game as well. I am thinking maybe this could be hacked up to make a Mighty Bombjack for the 2600... or a crude version of a Super Mario Bros type thing. Anyway, sorry I didn't get around to trying this out sooner. I was away for vacation and spent all my money so I didn't pay cable lol, so I've got little internet right now just when I am not busy at work. - you get stuck in middle of something and can't jump, you eventually just fall down and die. instead of pigs it has part of your key sprite.. not fully drawn. Great game and can't wait to see it finished. Edited by yuppicide, Tue Sep 9, 2008 7:02 AM. Most of the things that have been mentioned above have been fixed. This meant going through and redesigning some levels that needed it. I will try out the latest version and see. Again, great game! I hope, no I EXPECT, to see more from you in the future. This game has kind of halted progress on the game I was making because I see how much you did and now I want to do more too! Tried the latest build and it's great. Only thing is sometimes jumping from one screen to another your guy doesn't make the platform on the next screen and falls down. Added 3 more screens. You start at them. All the level designing should be done by the end of this week. Then, it's bug hunting time. In these last three screens, the big pig at the end is throwing bricks towards you. You must dodge the bricks *and* the pigs. If you want, I could add some more brick throwing levels. (right now, the number of screens in the whole game is 69, not counting level # announcement screens). Also, I've got a problem with the "The End" screen. I forgot to add Terrance and Phillip's hair in, so I did, and got this as a result. Notice how Phillip's hair is higher than Terrance's. Why is that? Here's a more polished version. In level 3, the health bar turns white, same as the background color. Since I can't control the color of the health bar, I changed the background color to a semi-dark blue. I wish it was white, and I wish level 5 had a black background, but the health bar's color is black, so I made it red. So, what changes should I make now, if any? I'm all done level designing, unless you think the game is too short as it stands right now. By the way, I solved the hair problem by making Phillip's hair shorter. Good work.Plays very well.Some screens are really heavy,but not impossible. Changed level 5's background color to gray. With it red, it was kind of hard to tell where Terrance's shirt was. OK, I think I finally got level 5's background color down pat. It's still gray, but then I realized that Terrance's shoes weren't visible. So I changed them to black, which meant changing the opening/title screens' background color to white. I also made level 1 day instead of night so you could see his shoes better. I also made small changes to Terrance's walking sprites. great work, this looks awesome.